I believe Christians should be grateful. They should live a life shaped by gratitude, among other attributes appropriate to Christianity. This gratitude begins with salvation. The person who recognizes what Christ did for them on the cross will overflow with appreciation when they turn from their sin and turn to Jesus in order to receive the great gift of grace made available by His suffering. Nothing I am aware of matches the glad exuberance of a new believer. If a person has never had this experience of overflowing thankfulness, it may well be they never had a genuine encounter with Christ. You see it’s possible to believe in all the right things and still not be a Christian. Redemption begins with a sinner becoming aware of the magnitude of his sin and the price paid for our sin by the Lord. This is followed by a conscious decision by the convert to accept the gift of salvation, which naturally is followed by a huge relief of the pressure felt by having been aware of the ugliness of his own sin. Salvation is not in the knowledge of the facts, but in the experience of making a personal commitment and receiving forgiveness. But as I mentioned earlier that starting point produces a wonderful gratitude in the believer’s heart. What comes as a surprise to many is that this sense of having been blessed, will not last forever. Even though the gift of salvation is eternal, the human heart will not retain the same gratitude for this salvation that it had when the experience first occurred. After the passing of time our thankfulness becomes more of a mental exercise, knowing we should be grateful, than an overwhelming, overflowing rush of emotion. Nevertheless, I still believe my first assertion. Christians should be grateful. As we walk and grow with Christ the ongoing experience of living as a believer should bring us back to the point of overflowing gratitude again and again. In other words, the proper living of the Christian life will bring you to thanksgiving, not just because of its miraculous gift at the start, but also because of the ongoing experience with a miraculous God in your day to day walk. 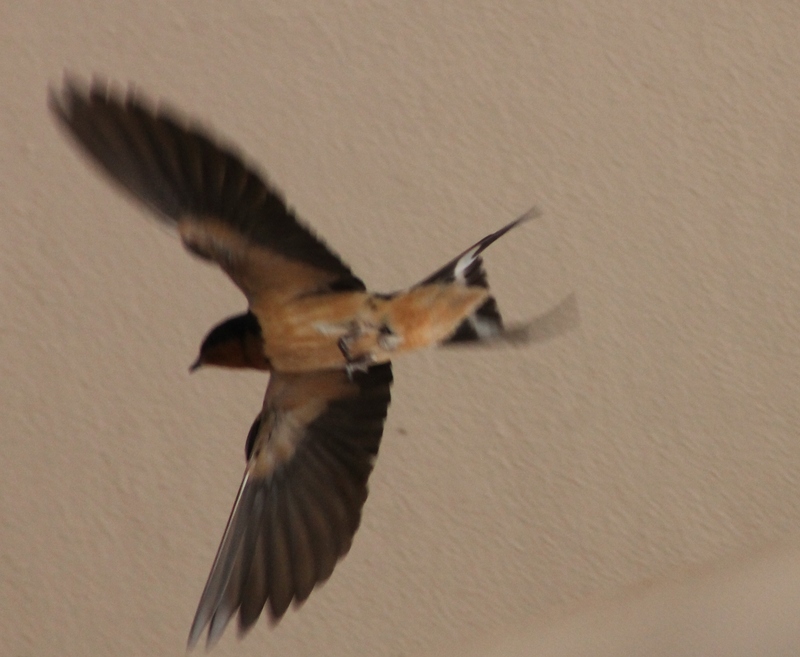 Here is a barn swallow. The picture is fuzzy because of the speed of the bird, but you can still see the distinctive swallow tail, and some of the white highlights in his tail feathers. I enjoy watching these birds because of their highly aerobatic flights. They will zip in and out and around man-made structures with ease. A couple of decades ago, I was birding alongside a pond in California when I noticed these birds doing mid-air stalls, followed by a flip turn and flight back in the direction they came from. In my mind I visualized the perfect picture this would provide as the bird stopped in mid-air for a fraction of a second with his feathers on both, wings and tail, spread fully apart showing the details most birders only get slight glimpses of. Unfortunately, this was before the age of digital cameras and it was impractical to keep trying to get the picture given the cost of film and developing after the first few failures. A mid-air stall is when the bird turns to fly straight up, without flapping or continuing to propel himself forward. Pretty soon gravity overpowers momentum and the bird begins to fall backward. This is when he would effortlessly flip himself, flying back in the direction he came from. There is that brief moment when gravity and flight are at odds with each other over the fate of the swallow. For just the briefest of moments it looks like gravity is going to win, but very quickly the truth is revealed. Gravity might have had a plan. It might have built up its own hopes of sending the bird splashing into the pond below. Those hopes were futile. The truth is, even when gravity was on the verge of defeating the bird, it was unknowingly serving the bird and its planned flight. So it is with Christ in the crucifixion. Satan, sin and death all thought for a moment they were going to overwhelm God and His Son. They hoped to see His pathetic attachment to lowly humans to become His downfall. Since He was foolish enough to take on their weak and decaying flesh, they would use this loving choice against Him. Crucifixion was accomplished. Satan’s victory seemed to be assured. Then came the resurrection, and the realization that Satan’s schemes served God’s will. It was our victory, not the devil’s, that was secured. and the power of sine is the law. What do you believe about Israel? Given current world events I believe this is a very relevant point of theology. Yes, world events and theology should and do affect one another. In fact, they must interact in order for theology to be either true or relevant. I believe God chose a man named Abraham to begin His kingdom restoration work on earth. I don’t say it was the start of His kingdom building, since God always had one intent and therefore it started with Adam. However at the time in history when Abraham was alive, the world needed a restoration work, we had fallen so far away from the God that created us, that we needed a God who would reach out to us. He chose Abraham to start this work and several promises were made to Abraham which are still important today. He promised Abraham to make a nation out of his descendants. This is the Jewish people. Many of the promises made to Abraham were to include the nation descended from him. It is true Abraham fathered another nation through Ishmael, and that specific promises were given to this son, but those promises were given separately and Ishmael did not inherit the promises passed down to the Hebrews. One of the promises is that God would bless the entire world through the Jews. I believe this promise was fulfilled by the coming of Jesus Christ. In God’s plan the kingdom restoring work suddenly expanded beyond the Jews and a few converts to be available to all the earth. I do not believe that Christianity on earth constitutes a new Israel. We have been grafted into the Israel that existed, and have not replaced it. Nor do I believe that every Jewish person is saved automatically. They must find their salvation, just as we do, in Jesus Christ. Another promises is God would bless those that bless Israel and curse those who treat Israel with contempt. I believe this promise is still in effect and applies to the modern nation of Israel. This is why I believe the topic is currently relevant. The United States has been backing away from every action which God previously blessed us for taking. We no longer honor Him, we are quickly losing our missionary power, we are no longer standing against tyranny, and now as a final straw we are no longer supporting Israel. You can expect God to bring about some changes as a result. Descriptions of classical Calvinism generally begin with a statement on total depravity. This doctrine means a lost man is incapable of reaching out to God, because of the manner in which sin has corrupted the human form. In this corruption, this fall, we are remade to not desire the things of God. We are free to choose what we want, but apart from God’s intervention we will not want God. Today I want to make a few notes about this construct and how people use Scripture to support this idea. I notice that with any doctrinal idea, the person who believes it, sees it in Biblical passages others would not. For total depravity, I have heard many verses cited, which made me scratch my head. Jeremiah 17:9 The heart is more deceitful than anything else, and incurable —who can understand it? Saying the heart is deceitful, or that humanity is sinful, is not logically the same as saying we are incapable of choosing God, or desiring God. It is logically uncomfortable to think God created a world where we are capable of choosing anything else, but not that which we were created for, that which we need the most. Romans 3:10-12 As it is written: There is no one righteous, not even one. There is no one who understands; there is no one who seeks God. All have turned away; all alike have become useless. There is no one who does what is good, not even one. This passage is part of a longer one speaking of the nature of sin. This discussion of the nature of sin is in a longer passage describing why we need Jesus. In this context, it doesn’t appear to me to be a statement of absolutes but of general tendencies. Yes it does use all-inclusive language, but like Jesus speaking of chopping of a hand, it is used for emphasis. If it were literal lost people would not be able to do any good. But we all see lost people do good things. In my opinion this includes the ultimate good of reaching out to Jesus for salvation. Ephesians 2:1 And you were dead in your trespasses and sins (Note, this is a part of longer passage you should read carefully if wrestling with this issue.) This passage is affirming we were spiritually dead prior to coming to know Christ. It is step beyond though to say that spiritually dead means unable to choose life. Spiritual death is used comparatively to physical death, but like any illustration, we can choose to include details unintended in the original text. 1 Corinthians 2:14 But the unbeliever does not welcome what comes from God’s Spirit, because it is foolishness to him; he is not able to understand it since it is evaluated spiritually. This verse is describing what the process of rejecting God looks like inside the person. The term unbeliever here probably means more than one who rejects God, but one who rejects all things spiritual. There is a habit of people arguing theological points to flood their opponents with Scripture, moving so quickly that each one cannot be evaluated as it goes by. While all of these passages will appear to read in support of total depravity to one who is already convinced of it, I have a hard time seeing it in any verse. In my view, humanity is incapable of reaching out to a God they do not know. The intervention they need in order to make them capable of choosing God therefore, is a faithful witness speaking of the Christ who took on flesh to reach out to them. Those who hear of Him, have sufficient new information to make them capable of choosing or rejecting God’s Savior. Romans 10:14 But how can they call on Him they have not believed in? And how can they believe without hearing about Him? And how can they hear without a preacher? One of the reasons I started writing about doctrine every Thursday is because our world needs to be reminded of doctrinal truth. The greatest challenge to truth is false doctrine. While studying for a sermon this morning I discovered five sources for false doctrine in 1 Timothy 1:3-11. In this passage Paul is reminding Timothy what task he was to do when left behind in Ephesus. The general idea was to deal with false teaching there, but in discussing it more thoroughly Paul mentions a number of things which could be taken as sources of false doctrine. So let me list for you some of the places false doctrine comes from. 1) A desire to be different: Whatever is, is. Therefore those seeking to know or teach doctrine should be pretty well aligned with each other, because these teachings should reflect what is. Unfortunately, humanity loves new approaches and new teachings. These new ideas often give rise to false doctrine. 2) Myths: Since doctrine is a search for truth, the inclusion of non-truths is highly destructive to sound theology. The word syncretism describes the attempt to blend believes from different religions into one spiritual viewpoint. It is an old problem, but is found fresh in every generation. 3) Endless Genealogies: This phrase is born out of a habit of the ancient Jewish person to find the value of a person by their heritage. In today’s world the equivalent is racism or any other idea that makes some people better than others. 5) Justify Sin: Probably the single largest source of false doctrine is teachings which are designed to allow us permission to do what we have every reason to know is sinful. Look at this picture and you will see two eggs. 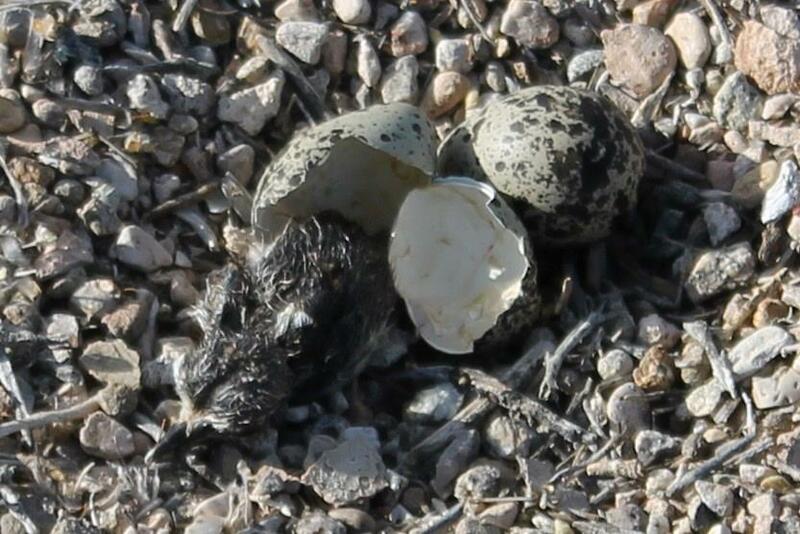 One is waiting to be hatched and the other is freshly hatched with a killdeer chick hanging out of one half. The poor thing is still wet from the egg and appears to be exhausted with the effort. In my opinion it deserves to be worn out, it just did one of the biggest and most important tasks of its life. Breaking out of the eggshell may be the most strenuous task of a bird’s life. It has been discovered by ornithologists that birds which are assisted out of their shell will not survive. It appears most species need the workout generated by the activity to build the strength necessary to sustain life. The existence of struggle being necessary for the furtherance of life is true for more than just birds. We who are born again into the family of God, by faith through grace in Jesus Christ will also have some struggles necessary for our progress. In the Christian life, you will have to wrestle with contrition leading you to admit and confess your sin, you will strain to perfect repentance and the failure therein will teach you to depend fully upon grace, and you will grapple with accountability allowing for ongoing discipleship. All of these challenges are found in the Christian journey of growth. So don’t despise the effort. If you want to continue to accomplish great things in life, or in your Christian life, you should take a lesson from the little guy napping in this picture. Rest is important. Recuperating in between challenges is just as important as the victories themselves. Failing to rest will bring our progress in these endeavors to a screeching halt. Yesterday I posted a repeat, which had not yet been added to the blog site. With some real world situations keeping my busy the next few days I am likely to continue this pattern. If you feel the need to pray for my wife and I over the next few days, it would be greatly appreciated. She will be having major surgery, and all prayers are appreciated.